Create exceptional healthcare experiences that improve market share. The patient experience impacts all areas of healthcare, including patient satisfaction, quality (as measured by HCAHPS), reputation, employee satisfaction, physician referrals, and, ultimately, the bottom line. This definitive resource for healthcare organizations, authored by two award-winning experience thinkers, delivers the proven solutions you need to create an exceptional and successful patient experience. The patient experience is your competition’s #1 priority. Make it yours, too. 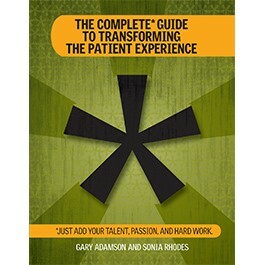 The Complete Guide to Transforming the Patient Experience comes with a multi-media, interactive CD that includes a compilation of best practices, examples of experience initiatives, and ideas to inspire your own experience efforts. Improving the patient experience is everyone's job, and it starts with top-level executives, including CEOs, CFOs, COOs, chief medical and nursing officers, and chief marketing officers. This guide will also benefit marketing, advertising, and PR directors, and anyone involved with the patient experience. Sonia Rhodes is the Vice President of Customer Strategy, and The Sharp Experience at Sharp HealthCare in San Diego, a not-for-profit healthcare system and recent Malcolm Baldrige National Quality Award recipient. The Sharp Experience is an organizational performance-improvement initiative designed to transform the healthcare experience for staff, physicians, and customers. Gary Adamson is Chief Experience Officer of Starizon, a consulting firm dedicated to helping healthcare organizations intentionally design the experiences that will significantly transform them and strengthen their brand success. He has worked with a wide-variety of healthcare organizations to develop unified innovations in strategy, operations, and communications.